Ht / Wt: 5'11" / 218 lb. 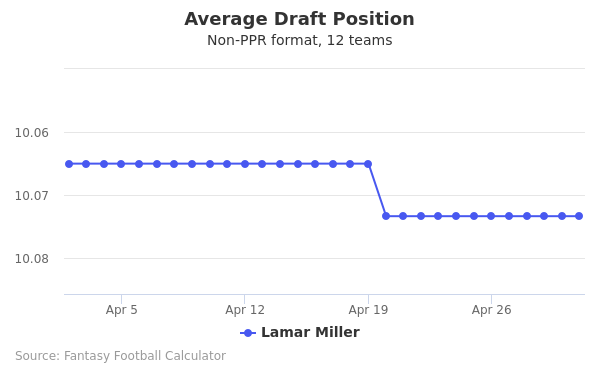 Lamar Miller's fantasy value is measured by his average draft position (ADP) in fantasy football mock drafts. 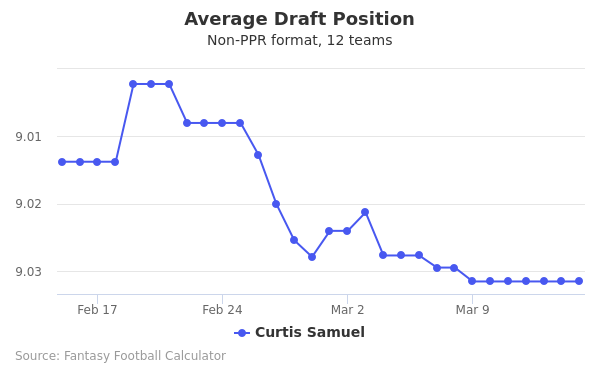 In recent drafts, Miller's current ADP is 6.06, which indicates that his fantasy outlook is to be the 6th pick of the 6th round, and 66th selection overall. 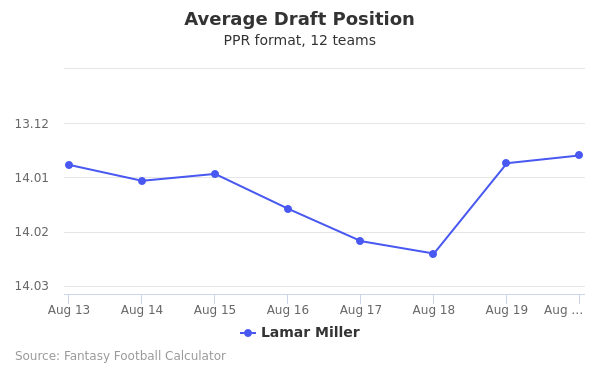 The code below will display a graph that updates every day to show the ADP data for Lamar Miller for the past 30 days in 12-team PPR leagues. Draft Jordan Howard or Lamar Miller? Draft Doug Baldwin or Lamar Miller? Draft Lamar Miller or Russell Wilson? Draft Lamar Miller or LeSean McCoy? Draft Lamar Miller or Tyler Lockett? Draft Drew Brees or Lamar Miller? Draft David Njoku or Lamar Miller? Draft D.J. Moore or Lamar Miller? 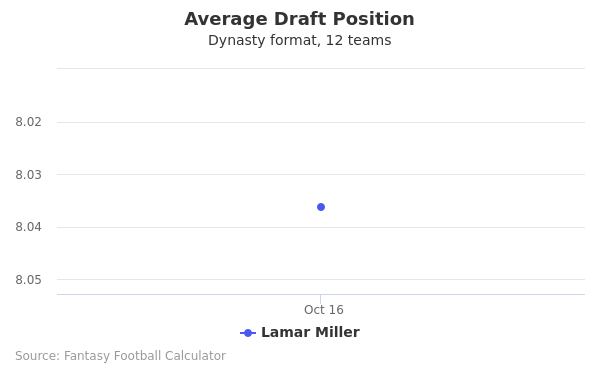 Draft Lamar Miller or Sammy Watkins? Draft Lamar Miller or Rashaad Penny? Draft Lamar Miller or Robby Anderson? Draft Kareem Hunt or Lamar Miller? Draft Corey Davis or Lamar Miller? Draft Lamar Miller or Matt Ryan? Draft Lamar Miller or Vance McDonald? Draft Lamar Miller or Philip Rivers? Draft Jerick McKinnon or Lamar Miller? Draft Carson Wentz or Lamar Miller? Draft Lamar Miller or Peyton Barber? Draft Allen Robinson or Lamar Miller? Draft Chicago Defense or Lamar Miller? Draft Lamar Miller or Latavius Murray? Draft Emmanuel Sanders or Lamar Miller? Draft Jared Goff or Lamar Miller? Draft Christian Kirk or Lamar Miller? Start Jordan Howard or Lamar Miller? Start Doug Baldwin or Lamar Miller? Start Lamar Miller or Russell Wilson? Start Lamar Miller or LeSean McCoy? Start Lamar Miller or Tyler Lockett? Start Drew Brees or Lamar Miller? Start David Njoku or Lamar Miller? Start D.J. Moore or Lamar Miller? Start Lamar Miller or Sammy Watkins? Start Lamar Miller or Rashaad Penny? Start Lamar Miller or Robby Anderson? Start Kareem Hunt or Lamar Miller? Start Corey Davis or Lamar Miller? Start Lamar Miller or Matt Ryan? Start Lamar Miller or Vance McDonald? Start Lamar Miller or Philip Rivers? Start Jerick McKinnon or Lamar Miller? Start Carson Wentz or Lamar Miller? Start Lamar Miller or Peyton Barber? Start Allen Robinson or Lamar Miller? Start Chicago Defense or Lamar Miller? Start Lamar Miller or Latavius Murray? Start Emmanuel Sanders or Lamar Miller? Start Jared Goff or Lamar Miller? Start Christian Kirk or Lamar Miller? Lamar Miller was born April 25, 1991 in Miami, FL where he grew up. He attended Miami Killian Senior High School where he set records as a running back on the varsity team, playing in both his junior and senior years. He collected a variety of awards during his high school career including being named as the Orlando Sentinel All-Southern ad the Mobile Press Register Super Southeast 120. He had the choice of attending the University of Florida or the University of Miami as his high school stats had him appearing in Top 10 rankings on Rivals.com and Scout.com. He decided to attend the University of Miami as he held other Hurricanes running backs in high esteem. He received his red shirt in 2009 and became the starting running back in 2011, where he rushed for over 1,000 yards--the first running back from Miami to accomplish this feat since Willis McGahee in 2002. His college highlights reels are impressive and saw his speed and agility enable him to carry for 108 times ad six touchdowns. Hhe attended the combine in 2012 where his vertical leap was logged at 33 inches and his 40 time was clocked at 4.40 seconds. Miller's performance in college saw him as one of the top draft picks in 2012. The Miami Dolphins drafted him in the fourth round. He was the 97th selected overall. He signed his first professional four-year contract on June 1, 2012 for $2.58 million which featured a $480,000 signing bonus for the rookie. The running back had a productive season for the Miami Dolphins in 2015, finishing the year out with eight touchdowns and 872 yards rushing. He received 47 passes for a total of 397 yards and two more touchdowns, his career best. He ranked 13th in rushing and 7th on rushing touchdowns. Only 17 players broke the 800 yards rushing mark that year while just eight were able to score eight or more touchdowns on the season. With the end of the 2015 season, Miller's contract expired. In March 2016, the Houston Texans signed him on with a new four-year contract worth $26 million, guaranteeing $14 million on salary. It was the sixth highest contract signed for a running back and fans were excited to welcome him to their team enjoying highlights of his career thus far. This would be the year of rushing for Miller, going for a total of 1073 yards while completing five touchdowns. During the season opener against the Chicago Bears he became the go-to man with a career best 28 carries. He received for 188 yards and added another touchdown to his scoring total.